This Little Piggy Went to Market...? I collect pigs, so I could not resist this four metal pigs on German Ebay. The seller had listed them as "silver?" but I think they are more like brass or bronze. They are heavy. They measure 1 5/8 x 7/8" and each one has a ring through his tail. I can't imagine wearing these as jewelry - they are just too heavy. Could they have been chained to a mother pig at one point? I can't seem to find anything like in on the internet, but maybe I'm searching for the wrong things. Any ideas would be appreciated. Thank you! OK - this group is usually really good with ideas - I can't believe no one has an idea about the origin of these pigs?! Does anyone else have anything like this? I did get curious and spent some time looking for something similar and simply gave up. The rings clearly indicate they “hung” on something. Surely not earrings are they! As I could not figure out what indeed these were made for, they seem clearly to have a FUNCTION, and not just a paperweight or a trinket, I just didn’t reply. Now I feel bad I didn’t let you know I gave up! It appears to me that when the pigs were put together after casting the tails were large and stuck straight out. I think the sculptor drilled a hole and inserted wires to make the tails curly like pigs have. Do I see green on the large pig's back? If so it is oxidation, called "verdigris". It's part of the patina which denotes age so don't polish it off. Silver tarnishes but doesn't turn green. I'm just now seeing this. Thanks very much for your thoughts. I think the "green" is a bad photo, as the pig does not seem to have that sort of patina in real life - more oxidized black. They look like painted cast pot metal to me. With the loops, I would think they are meant to hang and serve as weights for something. Just brainstorming, but maybe as window blind pulls or to hold the corners of a picnic tablecloth down? Perhaps even the ends of drawer pulls. I think you are on the right track. I wondered about clock weights. 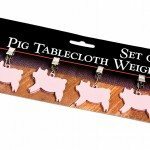 my thoughts were a "pigs weight" how much does each piece weigh please?